1. First, Let’s Clear Up the Confusion! There has been considerable news in both the broadcasting and print media, going back many months and years, discussing the tensions and violence in Israel and in the Palestinian Authority’s territories. Much of this has centered recently on Jerusalem’s Old City and the sacred shrines within that area which are of considerable religious and historical significance to Jews and Muslims (and Christians). Our readers are seeing many references to such places as the Al Aqsa Mosque and the Temple Mount, among others, so we will try to clarify the importance of these sites and why they are now generating so many headlines. Whether in the historical context or the present day turmoil roiling around these sacred religious sites, there often is no clear idea about exactly what is being discussed. So, let’s take a look at the “stars” of this very serious drama and tell you who they are. The area that has been fought over for many centuries is known as the Temple Mount by Jews (and most Christians), and as the Noble Sanctuary (Haram al-Sharif or Sarif, OR the Haram al-Qudsi al-Sarif, meaning the Noble Sanctuary of Jerusalem) by Muslims. This relatively small expanse comprises about 180,000 square yards in total size, and makes up about one sixth of the Old City of Jerusalem. It's importance for Jews is that the area includes the Foundation Stone, said in the Talmud to be the place from which the world was created, and then expanded into its present form. And, it is also the site of the First and Second Temples with the First one having been reportedly started by King David and possibly/probably finished by his son, King Solomon. 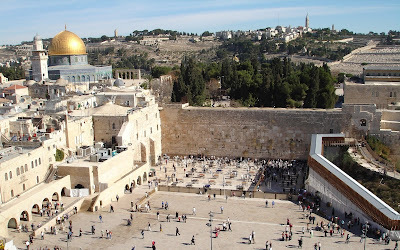 The “Western Wall,” also called the “Wailing Wall”, is the only visible remaining remnant of the Second Temple and, according to most rabbinical authorities, is the holiest accessible site at which Jews can offer up their prayers. For Muslims, there are three structures within the Noble Sanctuary sacred to Islam, all of which were constructed during the early Ummayad Caliphate. The first is the Al Aqsa Mosque, near where Muhammad ascended into Heaven on his “Night Journey,” and is regarded as the third holiest site of Islam. The Mosque itself has a darkish silver/lead dome. Nearby is the Dome of the Rock covering the Jewish Foundation Stone, and known to Muslims as the Rock from which Muhammad ascended to Heaven. This Dome also is called the Golden Dome because its round roof currently is covered by a mix of gold leaf strengthened by aluminum, and shows up on the Jerusalem skyline as perhaps the city’s most prominent feature. The third structure is the Dome of the Chain, immediately adjacent to the Dome of the Rock, but much smaller. It is used as a prayer house, but neither of the two Domes are mosques. We alluded to the importance of these sacred sites above, but that brief overview does not do the Temple Mount/Noble Sanctuary area justice. As noted, the Foundation Stone, also called the Pierced Stone because it has a small hole in one corner, is considered by Jews to be the holiest object/site of Judaism. Traditionally, it is the spiritual junction of Heaven and Earth and Jews face in its direction while praying since it is the location of the “Holy of Holies” in the original Temple. A cavern beneath the rock is known as the Well of Souls. The Temple Mount also was deemed to be the location for many important Biblical events, including the Binding of Isaac (when his father, Abraham, planned to sacrifice him), Jacob’s dream, and the prayer of Isaac and Rebekah. The Bible states that King David wanted to build a sanctuary there, but it was left to his son, Solomon, to either finish it or construct it in its entirety. Various Jewish texts also predict that the Temple Mount will be the site of the Third Temple to be built upon the coming of the Jewish Messiah. The stone on which this warning is inscribed in Greek was found in 1871 and is preserved in Istanbul, Turkey’s Museum of Antiquities. After the Temple’s destruction, disagreements arose as to whether the site, without the actual Temple, continued to be holy or not. It was finally decided that the holiness of the Temple itself had sanctified the site for eternity. 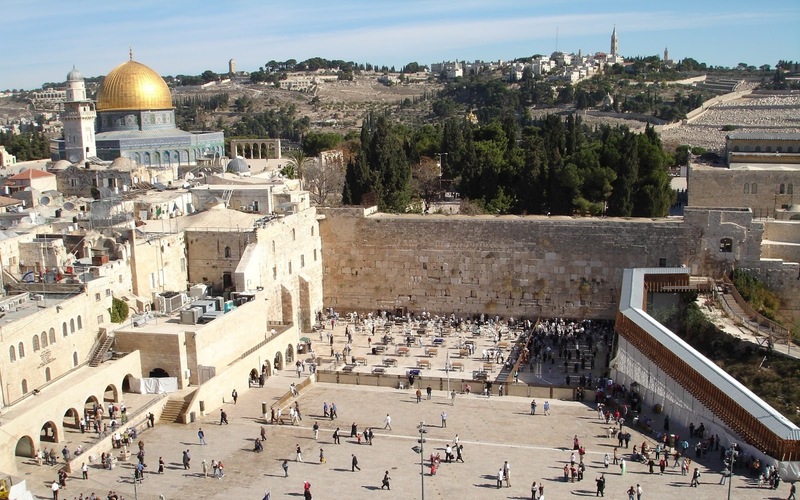 There is some question among Judaic religious authorities, however, as to whether the Foundation Stone actually is under the Muslim Dome of the Rock (which non-Muslims are not allowed to enter), and that it may be located a short distance away. Regardless of these details, one can imagine the frustration and pain for Jews that the Temple Mount site came under Muslim control (largely from the late 600s A.D. to the present), and that they are barred from entering it along with other non-Muslims (more about that later). For the majority Sunni Muslims of Islam, only Mecca and Medina are more significant than the city of Jerusalem and the above mentioned sacred sites of Jerusalem’s Old City. In fact, Muhammad enjoined his followers to face towards Jerusalem in the early years of Islam, an instruction that was shortly afterwards changed to facing towards Mecca and the holy shrine of the Kaaba. The Prophet also began his Night Journey to Heaven from the Rock (now under the Golden Dome) and met with Abraham, Jesus, and other heavenly figures. The connection of much of the Muslim traditional lore to Judaism is evident in references to the Mount as being the site of a Temple that was destroyed, and Muslim scholars even have used Jewish Torah references to discuss the details of that Temple. Since the Crusades, the Muslim community of Jerusalem has managed the sacred sites of the Noble Sanctuary without interruption. The Dome over the Rock was constructed in the 7th century to protect Muslims who wished to view the Rock from the elements. The Al Aqsa Mosque was built in the 8th century and technically, or popularly, now incorporates the Dome of the Rock as part of its grounds. It was intentionally built to rival the Kaaba in Mecca and draw more pilgrims, and its design was heavily influenced by the Christian Churches in Jerusalem. As we move into more recent history, the first major Jewish-Arab riots broke out in 1929 over the rights of access to the area which included these critically important sites for both Jews and Muslims (and Christians). Since the creation of Israel in 1948, Muslims have feared that Jews intend to destroy Al Aqsa and replace it with the Third Temple, something which some Jewish extremists have advocated, but which successive Israeli Governments have never supported. There are several Jewish groups which indeed have urged “moving” Al Aqsa to Mecca and building a new temple. Conspiracy theories abound on both sides (more on that later). Christians also attach considerable significance and affection to the Temple Mount, connecting it with Herod’s Temple which played a key role in the life of Jesus. At the age of 12, Jesus went to the Temple where he astonished Jewish theologians with his knowledge of the Torah (Luke 2:41-50), and later condemned the corruption of the merchants and money changers who used the Temple for their own profit (Matthew 21:12-17). Jesus also prophesied the destruction of the Temple (Mark 13:1-2) which did finally happen at the hands of the Romans in 70 A.D. During the Byzantine era, Jerusalem was largely Christian and pilgrims came in large numbers to view the places where Jesus had walked. The Byzantines also allowed Jews to live in the city again. When the Crusaders took Jerusalem in 1099, the Dome of the Rock was given to the Augustinians to administer. They turned it into a church, and the Al Aqsa Mosque became the palace of King Baldwin I in 1104. The Knights Templar, believing the Mosque to be the site of Solomon’s Temple, also set up their headquarters there for most of the 12th century. Some Christians believe that the Temple will be reconstructed before, or at the same time as, the Second Coming of Jesus, but the site has not been embraced as a “must” for Christian pilgrims. Jesus was said to have discouraged attachment to any physical place for worship in such pronouncements as “God is spirit, and those who worship him must worship in spirit and truth.” (John 4:21-24). That said, Jerusalem and the Temple Mount area, along with Bethlehem, Nazareth, and a host of other areas in the Holy Land, attract Christian visitors in large numbers. The above facts, traditions, and historical notes were meant to illustrate the centrality of the physical sites in Old Jerusalem to the religious beliefs of all three Abrahamic religions. During the British Mandate of Palestine from the end of WWI to 1948, there were frequent tensions and unpleasant incidents between the Arab and Jewish communities revolving around the Temple Mount and Al Aqsa. Despite these difficulties, a number of positive steps were taken to restore the holy sites, including very extensive renovations by the Jordanians with funding from several Arab governments and Turkey. The most significant change in the area’s status and administration occurred as a result of the 1967 “Six Day War” between Israel and several Arab countries which resulted in a swift Israeli victory and the conquest/occupation of East Jerusalem and the West Bank from Jordan. In order to defuse tensions, the Israelis almost immediately transferred authority over the Temple Mount and the Muslim shrines back to the Muslim waqf (religious trust) managed from Jordan. Since then, Israel has maintained control of the area and expanded Jewish settlements in East Jerusalem and the West Bank, but has maintained the sanctity of the arrangement with Jordan as regards control of all the holy sites in the Noble Sanctuary/Al Aqsa area. Interestingly, the often highly controversial prohibitive rules on who is or is not allowed to visit the sacred sites received some support from Orthodox Jewish rabbis who forbade their followers from entering the Temple Mount area without first being purified (a long rite which is considered to be impossible to perform today and under present conditions). That injunction has not ended the controversies with other rabbis and even Jewish politicians in the Israeli Knesset (parliament) pushing for greater or even unrestricted Jewish access to the Temple Mount to prevent possibly irreversible “Islamization” of the area. All of this has fueled Arab/Muslim anger, much of it genuine, but some artificially inflamed by efforts to put more pressure on Israel to stop blocking a truly independent Palestinian State and, eventually, to return East Jerusalem and all of the West Bank to the Palestinians. As this is written, almost daily stabbings and other acts of violence are being committed by Arabs in East Jerusalem and the West Bank against Israelis. Israeli police and military are likewise being criticized for “over reactions” that allegedly cause greater tensions between the Jewish and Muslim populations. There is considerable fear that the present deteriorating situation could become another “intifada” (uprising) by Palestinians against the Israelis. In the center of this storm of controversy and violence sit the holy areas of the Temple Mount and the Noble Sanctuary, still revered and venerated, but at risk due to modern day struggles that threaten their originally intended sacred significance as places of worship.